A far-right Austrian activist with a link to the New Zealand mosque gunman has had his US travel permit revoked. Martin Sellner, the head of the white nationalist Identitarian Movement in Austria, tweeted screenshots on Thursday of his email confirming the rejection of his US visa waiver permit. Austria is part of America's visa waiver programme, which allows citizens to travel to the US for up to 90 days without a visa. Travellers are simply required to fill out an authorisation form a few days before departure. 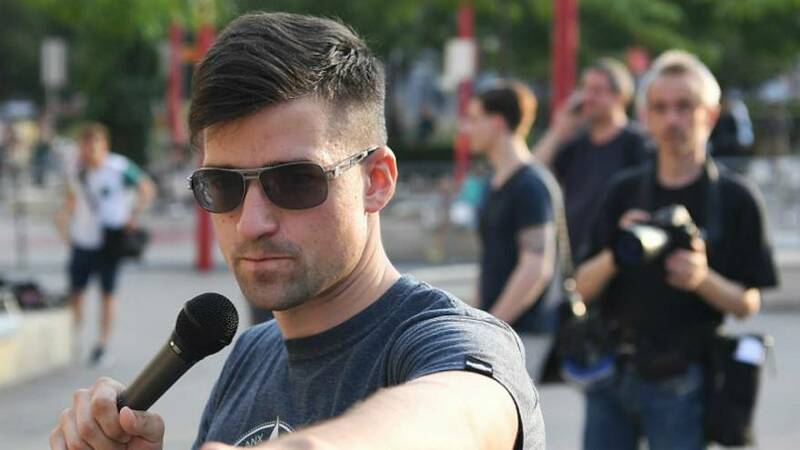 Sellner said he relied on the programme in order to visit his American fiance, alt-right YouTuber Brittany Pettibone, and that his marriage plans had now been affected. After calling US authorities, Sellner said he was told the decision to cancel his permit was based on his "background." Sellner is currently under investigation by Austrian authorities after a financial link was found between his branch of the Identitarian Movement and the New Zealand gunman, who killed at least 50 people after opening fire inside two mosques in Christchurch earlier this month. A €1,500 donation was made to the movement last year under the same name of the New Zealand attacker, which, at the time, prompted Sellner to send out an obligatory "thank you" message. Sellner has denied any further links to the attacker, maintaining that he was not aware of the attacker's future motives. It is not clear whether this was connected to the US' decision to cancel Sellner's permit. Euronews has reached out to US authorities for clarification. But this is not the first time Sellner has been denied entry to another country. In March 2018, both Sellner and Pettibone were blocked from entering the UK over plans to interview far-right British activist Tommy Robinson, and for Sellner's possession of leaflets that referred to "possible violence." In response to the US' recent decision, and the uncovering of the link between Sellner and the New Zealand attacker, Sellner's fiance described the spotlight as a "witch hunt." "Naturally, Martin and I will fight this decision, but either way, it will have no effect on our upcoming marriage," she added. "We will simply get married in Austria." Despite this entire situation being a witch hunt, my fiancé, @Martin_Sellner’s, ESTAvisa has just been revoked. He can no longer travel to the USA. In a Twitter thread, Sellner said the US' decision had indirectly "supported the criminalisation and slander" of his person, following the uncovering of the link. A number of critics also suggested the rejection could be based on Sellner's intention to marry in the US -- for those wishing to get married to a US citizen in the US and continue residing there, a fiance visa is required. But Sellner maintains that he did not plan to legally marry Pettibone in the US, instead wanting a church ceremony only.